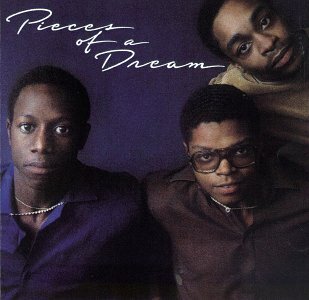 I first heard the contemporary jazz group Pieces of a Dream during the summer of 1981. Their song “Warm Weather” featuring Barbara Walker on vocals was in heavy rotation on late night radio. Their self-entitled debut album, Pieces of a Dream, also featured a wonderful instrumental version of EWF’s “All About Love” which is still a favorite of mine. The album was produced by the late sax great, Grover Washington, Jr., who was their friend and mentor. The original group members were Curtis Harmon on drums, James Lloyd on keyboards, and Cedric Napoleon on bass and vocals. Pieces of a Dream emerged on the Philadelphia music scene in 1976 while still in high school. Their name was based on a cover tune by Stanley Turrentine that they performed. They played on Temple University’s pioneering jazz radio station, WRTI-FM. Pieces of a Dream emerged out of Philadelphia’s music scene in 1976. Keyboardist James Lloyd, drummer Curtis Harmon and former bassist Cedric Napoleon, were (and still are) managed by the drummer’s father, Danny and Uncle Bill Harmon. The group based their name on Pieces of Dreams, a cover tune by Stanley Turrentine that the group performed. Soon Washington announced that he was starting a production company and that Pieces of a Dream would be his first act. Lloyd was only a senior in high school when his first record came out. Today, founding members Harmon and Lloyd are still keeping the soulful and sensual jazz grooves flowing. The group has changed and grown over the years but their sound has remained solid. Their recent releases, Acquainted with the Night, Sensual Embrace: The Soul Ballads, and Love’s Silhouette, are filled with beautifully arranged instrumentals and romantic ballads. Guest artists include the late Grover Washington, Jr., Maysa, the late Eva Cassidy, Maxi Priest, Gerald Albright, and Ronny Jordan. This is definitely the music for special evenings and quiet days. Enjoy your music. A Piece of a Dream question: On their first two recordings, Rachelle Barnes provides background and lead vocals and arrangements. I wonder if this is the extraordinary vocal diva Rachelle Ferrell who is also from the Philly area? Rachelle’s baby brother’s name is Russell Barnes so now you see why my musical wheels are turning. Update: A couple of years ago, I confirmed with Pieces of a Dream that Rachelle Ferrell did sing vocals with them back in the day. This entry was posted on Friday, June 6th, 2003 at 6:53 am. It is filed under Flashback Friday and tagged with Barbara Walker, Curtis Harmon, Flashback Friday, Grover Washington Jr., James Lloyd Cedric Napoleon, Pieces of a Dream, Rachelle Ferrell. You can follow any responses to this entry through the RSS 2.0 feed. Really brings back memories. I was also at the same time groovin’ to “HandDance” by The Reddings. Do you remember that one? the glasses, man… gotta love the glasses. I went to Temple University with Curtis and Cedric and their music was just as good then as it is today.